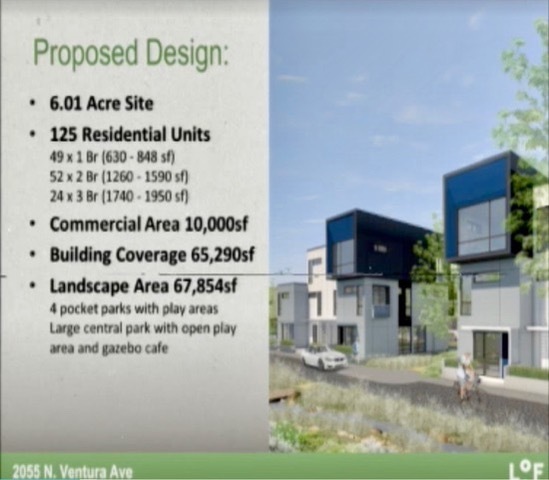 The Ventura City Council green lighted the review process for a local, controversial new residential-commercial complex, adopted an amended second-year Capital Improvement Plan, and authorized the city to fund the Museum of Ventura County another $250,000, during a marathon, 5-hour city council meeting Monday night. The meeting was so long that the council was forced to move the formal item of “Status Update/Receiving City Council Direction,” to a future meeting. Generating the most public interest during the evening was Public Hearing Item 11A – a Request for Call for Review, Leap of Faith Design Review. The bulk of the presentation was given by Leap of Faith (Applicant) co-founder, Noah Ornstein. This property, located at 2055 North Ventura Avenue, sits on a 6-acre lot, and originally was designed for 105 condos, commercial areas and 250 standard parking spaces. In 2014, PC/DRC approved a slightly amended version of the design (with 20 more condos, some added parking spots and some low and very low income units). The applicant, who purchased the property from the original owners in 2015 (as revealed much later resulting from council questioning), eventually proposed to amend the project significantly, prompting the PC/DRC to do a “pre-review” of the newly proposed building designs, construction methods, and in particular, the automated parking lifts. The new building design is to be more modular in shape and color than traditional buildings, while most of the construction will be done offsite, reducing construction time, cost, and lessening the noise and traffic impact on the community. According to Ornstein, the proposed automated parking lifts (190 of them), will eliminate the standard parking spaces, thus reducing the complex’s overall footprint, and creating an additional 20 thousand square feet of open space, which the company will convert to a park. “This was a previously approved project. The modifications that we have made to this project enhance our particular capabilities and unique aesthetic,” Ornstein told the council. Suz Montgomery: Opposes a new development on the Westside because of worsening traffic and parking issues. “Until we straighten out the parking situation and the traffic on the Westside, nothing should be approved. We have nothing. We have no services,” she said. Stephanie Caldwell: President/CEO, Ventura Chamber of Commerce. “The Chamber recognizes the lack of affordable housing as the single most significant impediment to economic growth and development herein Ventura. Housing at all levels continues to be a priority,” she said. She told the council that the project supports the need for more housing, and also meets the city’s environmental goals (due to Leap of Faith’s offsite building proposal). Caldwell concluded by asking the council to accept staff’s recommendation and allow the project to move forward. Matt Bell: Westside resident. Mr. Bell said he does not believe the project fits in with the community, and that he’s concerned about gentrification. He asked the council to delay their decision, and warned about power outages as they relate to the parking lifts. During the COUNCIL COMMENT AND QUESTION period, some confusion arose about the legal constraints on the council not being allowed to know which council members triggered the review, and what specific issues they were concerned about. Council Members Jim Friedman and Erik Nasarenko both asked City Attorney Greg Diaz for clarification. Diaz said that any council members who openly give such specifics would then have to remove themselves from the review process, though the details about the relevant law remains a mystery. While answering a question from Council Member Nasarenko related to a concern from a public question, Ornstein said that every automatic parking lift is equipped with a backup power supply and a fire sprinkler. Council Member Christy Weir discussed her safety concerns with the automated parking lifts in disaster situations. “I would not want any project moving forward that would have any possibility of trapping people in an emergency, and we have never done this before,” Weir said. She suggested that because of the council’s lack of experience with such lifts, as well as a lack of any documentation related to their performance from other places, she is hesitant on moving forward with the updated design. 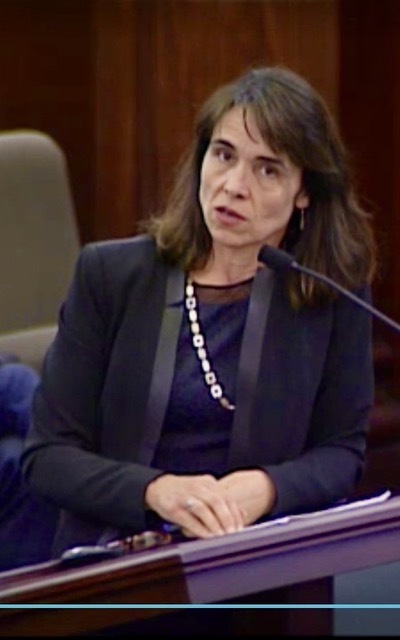 During Council Member Cheryl Heitman’s question session with Ornstein, it was revealed that the amended Leap of Faith project is made up entirely of rental units, as opposed to the owner-occupied condominiums of the original version of the project, causing visible shock to the council. Deputy Mayor Sofia Rubalcava said she was concerned that shoppers just wanting a quick cup of coffee at center won’t want to deal with the hassles of using the car lift, but will instead opt to park on the street, potentially worsening area street parking issues. She also asked Ornstein what the average rent of the condos will be. Ornstein, who at first did not appear to have an answer prepared, did respond after some more pushing by Rubalcava. He said they would target 35% to 40% of the average median income for the area. Mayor Matt LaVere confirmed with staff that the Fire Department will fully approve project safety at a future stage of review, and that no matter how the council ruled tonight, an unsafe project will still not get approved for the public. Council Member Weir then made a motion to have the Planning Commission staff research the practicality, safety and reliability of such a large number of parking lifts before the Planning Commission formally reviews the project (a future step in the process). “Because this has to be a part of their decision making,” Weir said. This motion was made into an official, “Special Condition,” added to the council’s final vote on the issue. Before the vote took place, however, some dissension on the tone and actions of the council materialized. Council Member Friedman thought the council was micromanaging in areas where it had no expertise. “I took a 15-year-break. Now I see why (laughs). I’m not sure I have the experience to micromanage the design of the project. I trust staff and the bodies that have seen this before,” he said. 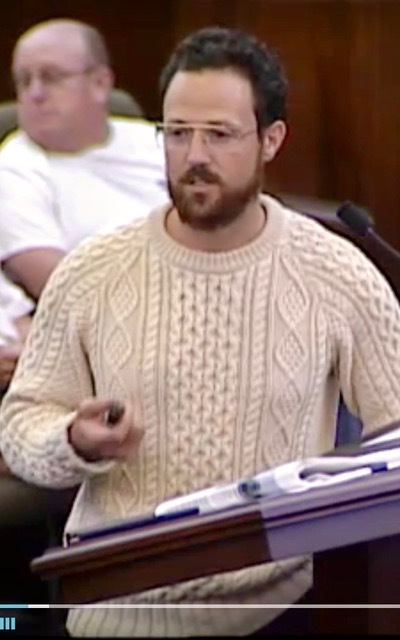 He said he would like to approve the project, and would hope that the council would either approve or deny the project as it has been presented. The council voted to approve the reviewed project with the special condition added, 6-1. Rubalcava was the only “no” vote. The council is required by charter to adopt this year’s Capital Improvement Plan no later than April 1, 2019. The votes for the additions to the CIP all passed unanimously, with any conflicting council person abstaining where necessary. Formal item 12B was seeking direction for, and authorization for, funding for up to $250 thousand for the Museum of Ventura County, for FY 2019-20. The presentation was given by Museum Executive Director Elena Brokah. Some of the key ongoing program goals for the museum include increasing attendance, bringing in diverse audiences and developing robust partnerships throughout the county. In the last eight months of completed records, some accomplishments of the museum under Brokah’s leadership include increasing audience numbers by 25%, introducing 35 new programs, launching multiple rapid response collecting efforts, and designing/starting construction on interactive amenities in the Children’s Garden. As for private funding, during that same eight month period, the museum raised nearly $900 thousand, increased earned revenue by over 50%, and secured 248 new donors. The museum has spent more than $1 million, however, including $900,000 on an endowment, with the rest on capital improvements, projects and operating expenses. The museum still requires a new roof, at a cost of $240 thousand, and another $140,000 for other one-time projects. Council Member Nasarenko asked what the previous $250 thousand granted to the museum went toward. Ms. Brokah said it did not go toward specific projects. “We had milestones that we had to achieve. It went into projects that were going to bring in new donors.” She also said any new endowment would be used in a similar fashion. Nasarenko is fully behind the museum. “I fully support ongoing funding. I think the reconstituted board, your leadership, is vital to our city,” he said. Council Member Friedman also supports the museum, and even said that he personally contributes money to it, , but said he is not going to be able to support allocating public money to the museum this year. “It’s not because I’m not supportive of the museum… It has to do with the fact that I ran on essential core services. And the museum, as much as I may love it, is not an essential core service. Essential core services would be public safety, our Police Department, our Fire Fighters. It would be fixing our streets, and our sidewalks and trimming our trees,” he said. Friedman added that since he’s been in office, not one person has asked him to send more money to the museum. “It’s embarrassing how our infrastructure has been allowed to crumble,” he commented. The Mayor’s “State of the City” will be on Monday, March 25, 2019. The next City Council Meeting will be held on the same day, at 6:00 pm. Video archives and agendas for the Ventura City Council Meetings are available at http://cityofventura.granicus.com/ViewPublisher.php?view_id=2.